HERE'S YOUR CHANCE!!! 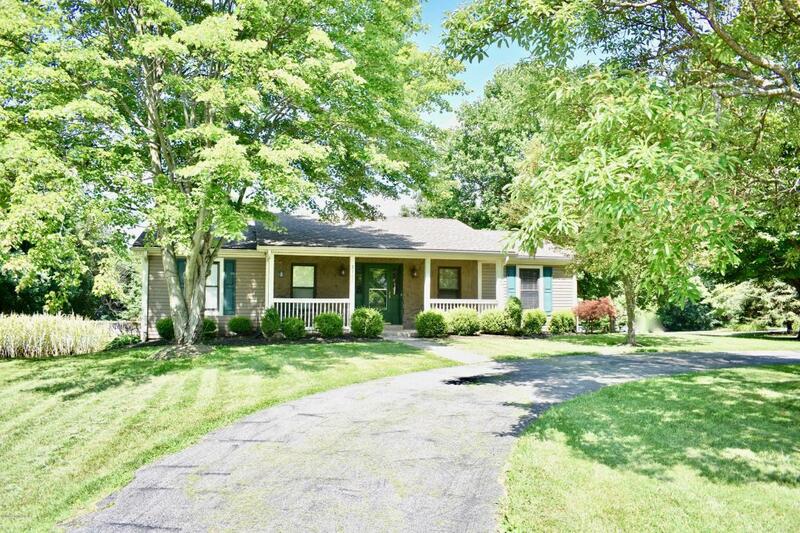 Finally a 3 Bedroom, 3 Full Bath Ranch nestled on 1.3 acres in highly sought after Borowick Farms in OLDHAM COUNTY! This Move In Ready home features a Stunning OPEN FLOOR PLAN with vaulted ceilings in the Great Room and Dining area! Boasting skylights, hardwood floors, cozy stone fireplace and adorable bay window with built in storage bench! The Huge Kitchen provides tons of storage, stainless steel appliances, and a breakfast bar! The master suite features a large walk-in closet, and updated master bath with a double vanity and tiled shower! The main floor finishes out with a nice big second bedroom with walk in custom closet and updated full bath in hallway. The WALKOUT BASEMENT features a spacious family roomand additional bedroom, an enormous office/bonus room, laundry room, and updated full bath. From the walk out you can access the 1 car attached garage as well as additional storage room. It's HOT out! What better way to spend these hot summer days than sitting on the deck or swimming in the crisp pool! This home is an entertainers dream with the open floor plan leading out to the deck, down to the cover patio and out to the huge pool looking out over the picturesque, tree lined back yard! Offering more parking than you could ever need with a circle drive in the front, circle drive on the side, as well as, a large driveway leading to the attached and detached garages! Calling all Car Enthusiasts! In addition to the the 1 car attached garage, you will be blown away by the MASSIVE 3-4 car detached garage!! Offering lots of built in storage along the walls and a work bench! The BONUS ROOM/LOFT above the garage is perfect for a Rec Room, Man Cave, small business or workshop! You could spend the whole weekend in the garage alone! Equipped with an underground invisible fence for your pets, and a RFID chip dog door in the basement so only your pet can get in! You can't beat this LOCATION!! Only a few minutes from the AWARD WINNING OLDHAM CO SCHOOLS, expressways, shopping, dining, parks, and expressways! Call today to schedule your private showing! Listing provided courtesy of Seville Realty, Inc.. © 2019 Metro Search, Inc. All rights reserved.